Denmark has many beautiful and historic cities worth visiting any time of year, though your experience may vary with the seasons. Fortunately, you can travel quickly and easily from city to city in Denmark, with several transportation options available between most of them. Additionally, many Danish cities have large pedestrian zones located in their central districts, which makes shopping and soaking up the atmosphere an easy, pleasurable task no matter where you go. From Copenhagen to Esbjerg, the following cities offer something for every type of traveler; whether you're a history enthusiast or a fan of the great outdoors, the sights and experiences you'll find in Denmark are unlike anywhere else in the world. Founded in 1167, Copenhagen is Denmark's capital and has become a modern melting pot of cozy cafes, amazing architecture, and interesting historical landmarks. The city's long harbor faces Øresund, the 10-mile-wide wide waterway separating Denmark from Sweden, and the view from the waterfront alone makes the city a must-see destination in the region. When it comes to entertainment, there are also plenty of free things to do any time of year. Whether you're touring the King's Garden at Rosenborg Castle or attending one of the free events like the Copenhagen Pride Festival or Midsummer's Eve celebrations, you're sure to enjoy your trip to this waterfront city. Aarhus is a charming city that currently serves as Denmark's principal port, which makes it a great spot for finding some of the world's freshest seafood. 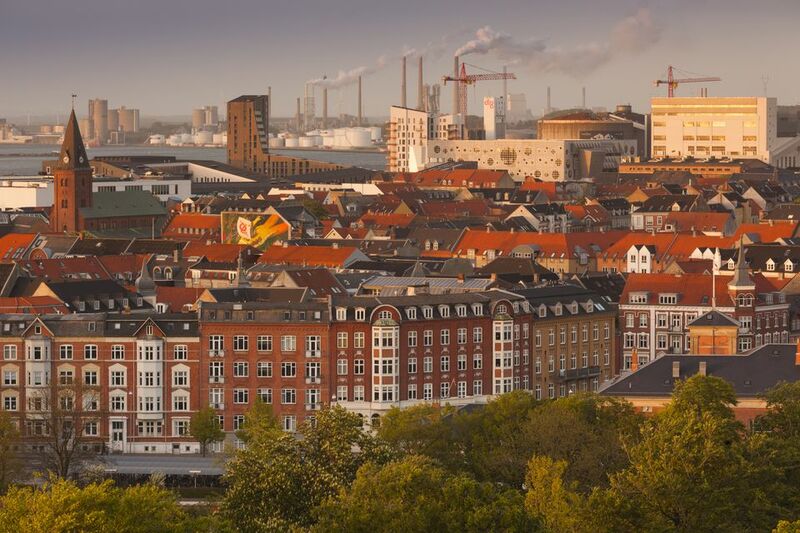 You'll find Aarhus on the east coast of Jutland, Denmark's western peninsula, about a three-hour drive from Copenhagen, but you can also travel to Aarhus from the Danish capital by bus, boat, or air. Nightlife, sidewalk cafes, and architectural sites rich in cultural history are the primary attractions in Aarhus. After dusk, you can dance the night away at the Train, Glazzhuset, or Muskaefeen clubs or grab a casual drink at Herr Bartels, The Römer, or The Blender bars. Aalborg is one of the few cities in Denmark not geared toward tourism, and because of that, it has retained its old-world charm as a quaint university town. However, Aalborg, whose history dates to 700 A.D., also hosts the largest carnival in Northern Europe and is one of the northernmost cities on the list. You should also bring your camera to capture images of some spectacular sites such as Limfjord, a North Sea fjord that has been well known to Danes since the Vikings ruled the country. You can stop by the Aalborg Historical Musician, which was established in 1863, or stop by the Lindholm Hoje Museum at the archeological dig site that uncovered antiquated internment destinations from the Viking era. When it comes to Danish cities worth visiting, you can't top Esbjerg, which is the largest city in the region. Esbjerg is a bustling port city in the southwest of Jutland that provides picturesque views as well as plenty of shopping opportunities, entertainment options, and fascinating museums. From here, Fanø is just a ferry ride away on North Sea island, which offers tourists a chance to enjoy long, sandy beaches and massive dunes. With a population of just 50,000 people, Roskilde is still a city worth visiting on your trip to Denmark. Located just 19 miles west of Copenhagen, Roskilde offers a number of historical sites including 1th-century Viking vessels and an active boatyard next to the harbor. Each year in June and July, the Roskilde Festival welcomes over 130,000 visitors from around the world to the city to experience eight days of music, art, activism, and events featuring over 180 acts, delicious food, and plenty of entertainment. Other times of the year, Roskilde is relatively quiet but still offers plenty of great attractions for casual tourists. For a unique experience, you might consider heading west of the city to the Land of Legends attraction, where actors recreate Stone Age and Viking life at an interactive open-air museum. The third-largest city in Denmark is Odense which is located a little over 100 miles southwest of Copenhagen. With a population of over 180,000 people, this growing city boasts some great attractions of its own. From its award-winning zoo to the many great museums like Brandts and the home of Hans Christian Andersen, you're sure to find something to do on your trip any time of year. As an added bonus, there's also a city beach within easy access if you're visiting in the summer. Known as the "Home of Hamlet" the city of Helsingør (Elsinore in English) is located in eastern Denmark on the shores of Øresund strait. A 15th-century castle, Kronborg Castle, served as the setting for Shakespeare's "Hamlet," and is currently the city's most popular attraction. However, you can also stop by the M/S Maritime Museum of Denmark or the Culture Yard to catch a glimpse of over 600 years of Danish history at sea. Additionally, the summer residence of the Queen of Denmark, Fredensborg Castle, is also relatively close to Elsinore, and you can make a day-trip out of touring this piece of architecture.